Located west of Short Pump in Rockville, Midnight Brewery is one of Richmond’s new craft breweries. Midnight Brewery, located west of Short Pump in Rockville, is the dream of Trae Cairns come to fruition. Born and raised in Henrico, Trae is a native Richmonder who takes pride in his hometown; so much so that on the back of Midnight’s T-shirts he has emblazoned “Virginia Born and Brewed”. After working for several years in IT at Estes (a Richmond-headquartered and family-owned trucking company), Trae turned his dream into a career in late July when he started working full-time at Midnight. An avid homebrewer, he’s now working hard to find his place in Richmond’s growing craft beer scene. The name Midnight Brewery comes from the late nights he put into learning how to make great beer. It is a family operation–in fact when I went to visit the brewery his mother was working the tap handles in the tasting room. Trae also has an invaluable group of helpful volunteers, eager to see a new brewery in their neighborhood, who staff the tasting room so he can focus on the other aspects of running his business. Trae began looking for commercial space for his brewery over a year ago. He told me that finding space to operate has been one of his biggest challenges to date. Strict zoning requirements in both Henrico and Goochland make it a challenge to find the right sized space at the right price for a small startup brewery. The names of his beers, like New Beginning Kolsch and their newly released Head First Pale Ale, reflect the challenges he’s faced in getting Midnight up and running. In addition to the Kolsch and Pale Ale, Midnight also makes a Rockville Red. I tried both the Kolsch and the Red, and they were solid beers that Midnight can build its brand on. Trae takes them to new levels by pouring them through a randall filled with watermelon, lime, raspberries, coconut, or cocoa nibs. Back in March, Midnight got a jumpstart by brewing a collaboration beer with Hardywood Park called Banana Pancake: a maple weizenbock beer that I wish I had been able to try! Maybe if we keep asking, Midnight and Hardywood would be willing to brew a second round. Essentially, this means that licensed breweries in Virginia can, for the first time ever, sell directly to their customers inside their facilities without having to operate a restaurant. SB604 has had a profound effect on several Virginia breweries already, and I believe Midnight Brewery is an example of just how instrumental this bill will be for Virginia’s craft brewing industry. 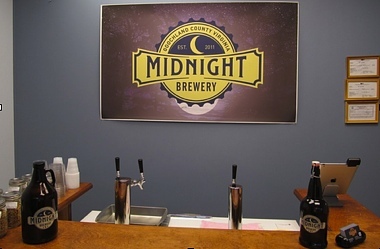 Midnight is now able to sell full pints in their tasting room rather than relying on distributors and retailers to sell their beer for them. For startup breweries like Midnight, the ability to keep every dollar of revenue in-house rather than paying distributors and retailers to sell their product makes the difficult startup period slightly easier. More dollars directly to the brewers means more breweries are likely to startup and grow. If you can’t make it out to Rockville, you can find Midnight’s beers at all three area Capital Ale House locations. Trae loves sharing his beers with people, so if you see Midnight Brewery at one of Richmond’s many festivals stop by to say hello, and buy a beer, you won’t regret it.